I’ve had my Steadicam Pilot for a little while now, and have spent many hours researching and learning to use it (purchase options, setting it up, practicing, and researching accessories). I’ve posted most the results on several threads over various forums, but since the Pilot seems to be selling really fast, there are probably a lot of new and potential Pilot users out there. So I thought it might be useful to post everything I’ve discovered so far in one place to get people started. Of course, I might have some of this wrong, so please correct me. Also, some of this info has come from other folks, particularly Mikko Wilson and Ted Spencer, so many thanks to them. Anyway, here are the questions that I asked, and the answers I found so far, starting with the most basic questions, then getting more and more detailed, so skip forward as needed. Q) How is the Pilot different than other Steadicams? A) The Pilot is the least expensive Steadicam that still has all the basic elements of their bigger rigs (i.e. vest, arm, and sled with monitor and batteries). The Pilot was made to handle the new class of HD/SD cameras that weigh up to 10 pounds. Note that the 10 lb weight limit includes everything you add to the camera. Q) How many versions on the Pilot are there? A) There is the Pilot and the Co-Pilot, with multiple battery mount options for each, 5 versions in all. The Pilot versions come with a larger LCD widescreen monitor and a back-pack / carry case with sculpted foam compartments. Q) Which version of the Pilot should I buy? A) I think most people will choose the Pilot-AA version. For the relatively small difference in price, I would forget about the Co-Pilot. That leaves the Pilot with 3 battery mount options. Most of the cameras that work with the Pilot use 7.x volt power, so it’s fairly typical that the Pilot’s 12v batteries will only power the Pilot’s LCD monitor. For this scenario, the AA battery option is adequate. The other battery options end up being quite a bit more expensive. Q) How much does the Pilot cost? Q) How long do the AA batteries last powering just the monitor? A) A freshly charged set of 10 AA NiMH high power batteries will power the monitor for around 4 hours at room temperature. A new set of 10 AA alkaline batteries will last longer, perhaps up to 8 hours. Pro batteries like the IDX E-7S will go even longer than that. Note that battery performance degrades significantly at colder temperatures. Q) What happens on the LCD monitor as the batteries begin to die? A) First, the color de-saturates. Then it'll flick completely to black and white. Really push it, and it starts blacking out at regular intervals. The main point here is that it’ll let you know it needs new batteries before you’re in danger of losing the shot. Q) Doesn’t changing and charging 10 AA batteries take a lot of time on location? You can also bring along a set of alkaline AA batteries for emergencies, so using this method you’ll probably never need to unpack your AA battery charger on set. More details on ordering accessories later on. Also, once you get used to it, it doesn’t really take that long to deal with 10 AA batteries. It probably takes longer to unpack and plug in the battery charger (and make sure nobody sits or steps on it). Q) If I buy a Pilot-AA and then want to use pro batteries later, am I stuck? A) No. You can buy a VL or AB battery mount as an accessory. They swap in seconds. Q) Do I need anything else to use the Pilot? A) Besides a camera, you’ll need a stand to balance the sled and hold it while you’re not using it. A regular lighting stand will work, but the $160 SteadiStand has many advantages: Lightweight, Collapses very small, Has a small bubble-level to help align the sled better, Much more stable (you don’t need a sandbag to keep it from falling over), and the peg on top fits the Pilot Dock plate better. Well worth the price. Q) Can the Pilot be used in Low Mode? Note that with the camera upside down, the image on the Pilot’s LCD monitor will appear correct, but the recorded image has to be flipped in post. This works just fine with progressive video - interlaced video can have issues depending on how you flip it. With the Pilot sled’s vertical carbon-fiber pole extended fully, the camera can get fairly low. You can also order accessories to get the camera even lower and/or mount the camera upright so you don’t have to flip it in post (more on that later). Q) What do I do while I’m waiting for the Pilot to arrive? Read the Merlin Arm & Vest Quick Start Guide to get more info on adjusting the vest. Make sure you have at least 10 charged AA batteries on hand. Make sure the stand arrives at the same time or before the Pilot arrives. Q) What do I do when the Steadicam Pilot arrives? 1) Set up the stand so the feet are wide with the legs fully extended. Tighten the legs and the leg yoke. 2) Level the stand using the small bubble level and adjusting the length of the feet. 3) Extend the stand’s vertical post so the top is about chest height. Tighten post. 4) Remove the Vest and foam layer from the Pilot backpack. 5) Place the Pilot Dock plate on the top of the stand with the gimbal mount pin directly over the stand leg that has the Steadicam logo. 6) Tighten the dock plate with the black plastic wing-nut. 7) Place the yellow-handled hex-nut driver down through one of the holes in the top of the Dock plate. 8) Place the Pilot Sled gimbal over the gimbal pin on the Dock plate. Turn the gimbal so that the sled is the furthest from the stand’s vertical pole. 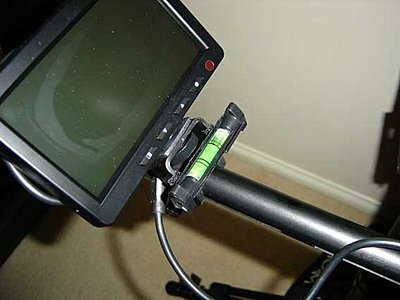 10) Mount the camera onto the camera mounting plate using the screws provided in the small plastic Ziploc bag. 11) Mount the camera on the stage using the 4 thumbscrews. 12) For the Pilot-AA, remove the plastic 10-AA battery holder from the mount by loosening the battery mount’s right plastic wing nut, then pull on the bottom of the battery holder just under the Steadicam logo. 14) Add screw-on weights as desired. Screw-on weights on the ends of the bottom cross-bar increase inertia on the pas axis, which helps create smooth pans. Adding weight to the bottom of the sled also increases tilt and roll inertia. Adding Screw-on weights to the stage lowers the camera height. Adding weight to the sled in general makes the rig more stable (helps isolate the sled from your body movements). 15) Adjust the length of the sled vertical post as desired. Increasing the length of the post increases inertia in the tilt axis and roll axis, but also raises the camera height. 16) Attach the composite video output from the camera to the RCA connector on the back of the stage. Q) How do I balance the sled? Note: compare the vertical post of the stand to the vertical post of the sled to accurately gauge static balance. Q) How do I get into the rig? 1) Put on the Vest. The Merlin Arm & Vest Quick Start Guide is good for this. 2) Attach the arm to the vest using the Pilot Quick Start Guide as a reference. 3) Place the gimbal of the sled over the gimbal pin at the end of the arm. Q) How do I use it for the first time? 1) Turn on the camera and set it to record-standby mode. 2) Turn on the monitor at the bottom of the sled. 3) If the arm attaches to the right side of the vest, keep the sled on your left side, fairly well back, so that the battery pack is near your left leg. Opposite for lefties. 4) Adjust the 2 blue knobs on the top of the arm so that both sections are approximately level. Watch that you don’t pinch your fingers here. 5) Right hand on the gimbal handle. Left hand on the sled post just under the gimbal. Light touch on both hands. 6) Bend your legs slightly, and start walking. Q) How do I get good at using the Pilot? 2) Order the EFP Training DVD (details further down). 4) You might try walking around with your hands not touching anything at all, and just let the balance of your body control the position of the sled. This improves balance so that your right hand touch can get lighter. 6) It’s also good to practice with moving subjects. Kids are particularly challenging. Q) Does the weight of the camera affect the performance of the Pilot? A) Yes. The more weight, the more stable. You can use a small (e.g. 1 pound) camera for practice, but then you’ll need to add all of the supplied screw-on weights on the stage. In this case, the sled will act very differently, and won’t be as stable. Actually, I think it’s best to get the stage weight up to at least 6 pounds for any camera. So if your camera, batteries and other camera accessories total significantly less than 6 pounds, you may want to consider adding weight to the stage. This can be done by ordering more screw-on weights, buying or building a custom stage weight plate that goes underneath the camera, or a combination of both. I made a custom stage weight by sandwiching parallel strips of 1/4"x 1.5" metal stock between 2 sheets of thin birch plywood. Alternatively, you can Google Steadicam "Practice Cage". In the end, the closer you get to the 10 pound limit without exceeding it, the more stable the rig will be. I’m aiming for 9.5 pounds, and using a combination of a stage weight plate underneath the camera plus additional screw-on weights (currently on order). Q) How much do the screw-on weights weigh? A) The small rounded end weights are 2 oz. The larger middle weights are 4 oz. Q) What accessories are useful for the Pilot? Q) How do I order accessories? A) Contact Harry Hoffman, 1-800-645-2522 x1405 or hhofmann@tiffen.com. The low mode bracket or kit may be ordered retail. Note that Tiffen currently needs all the plastic battery holders they have to build Pilot-AA models, so these won’t be available through Tiffen for a month at least. However, I was able to find the identical part on eBay for only $4: http://cgi.ebay.com/ws/eBayISAPI.dll...m=120222255603. Q) How do I record sound when the camera is on a Steadicam Pilot? 1) Use a shotgun microphone that rides on the camera. 2) Use a wireless link to get sound to the camera. 3) Use wireless to get sound to the camera, plus a separate wired recorder as backup. 4) Forget about wireless, record sound on a separate wired recorder, use a clapper/slate in production, and then manually line up everything in post. The first method is the easiest, but has the worst sound. The second method can be used with either a boom pole shotgun, or a wireless lavaliere mic. Note that most wireless lavaliere mic systems also accept a line input on the wireless transmitter, so if you have something that will act as a microphone preamp (e.g. small mixer or field sound recorder), then you can use a wireless lavaliere mic system with a shotgun mic on a boom pole. Also note that wireless systems can produce noise and/or dropouts in adverse conditions, which leads to the third method above. You may want to have sound also recorded on a wired flash memory field sound recorder as backup. If the wireless audio to the camera has problem spots, you can still use the good spots of wireless audio to manually line up audio from the flash memory field sound recorder. Method #4 has the best sound, but takes the most time in post. Q) How do I keep focus with a Steadicam? 1) You can try autofocus, but things will probably look bad when you pan. 2) Buy or rent a wireless follow-focus/iris system, and have an assistant cameraman work it, but this is fairly expensive for productions that would normally be associated with the Pilot. 4) Add more lighting, zoom out, and close down the iris to get more depth of field. Then try to maintain a fairly constant distance from the subject as the steadicam moves. Q) How does the other crew see the shot? A) Use a wireless video link. The good news here is that there seems to be some inexpensive wireless video solutions that work fairly well for this, except under adverse conditions. Specifically, it appears you can buy a small transmitter that will broadcast to TVs on unused channels. This includes handheld TVs. So you may not need a receiver for this. Where is the bubble-level on the steadistand? It's on the sliding center of the tripod base next to the inside end of one of the legs. The monitor should have a bubble level. The first thing I did when I got my Pilot is velcro one at the monitor base. This is a nice post. We've been working with our new addition and have been very happy. The one issue I have had is a 'squeek' which I have confirmed is coming from significant movement up and down or back and forth. The 'squeek' is coming largely from the hinges, and initially I thought it may be the springs, because that is what i sortof sounds like. You can hear it here http://droptodesign.com/test/pilot/ you may need to turn your volume up. So I bought some brake grease after speaking with steadicam who told me to get some oil and see if it helps. It has helped some, but since you have metal against metal on the hinge, it's going to be tricky getting it to stop. I have another plan using plastic washers. Cool! Tell us more. Where did you get it? Any tips on mounting? Any tips on using? Any other info appreciated. Thanks. Hardware store for 5 bucks, plus some sticky sided velcro. Easy. Sounds like more of a creak than a squeak. You may also try some white grease - the kind they use on car door hinges and such. That stuff is supposed to last forever. My arm has never made any noise though. Also, I've heard moving joints that use specific combinations of metal aren't supposed to need lubrication. So if it keeps coming back, you may want to see if Tiffen will replace the arm for you. Yeah, I'm still thinking about how to approach it best, trying this and that. Originally I though the noise was coming from the springs, but the way I figured out it was the hinge was to squeeze the hinge with my hand and the noise reduced. I also closed the arm, (bent it closed like you would close your own arm), and the noise goes away. As you have suggested, I'm in communication with Tiffen about it. The noise concerns me because I can just imagine that initimate moment at a wedding or bridal parlor and suddenly SQUEEEEK, and everyone looks at me..... hehe. Ok that's not funny. Any tips on using? Any other info appreciated. Thanks. Or you could do like the Ancient Egyptians and hang a plumb weight from a string from your mounting arm. Strange, dont have it om my Steadistand. Maybe there are two versions of the stand.